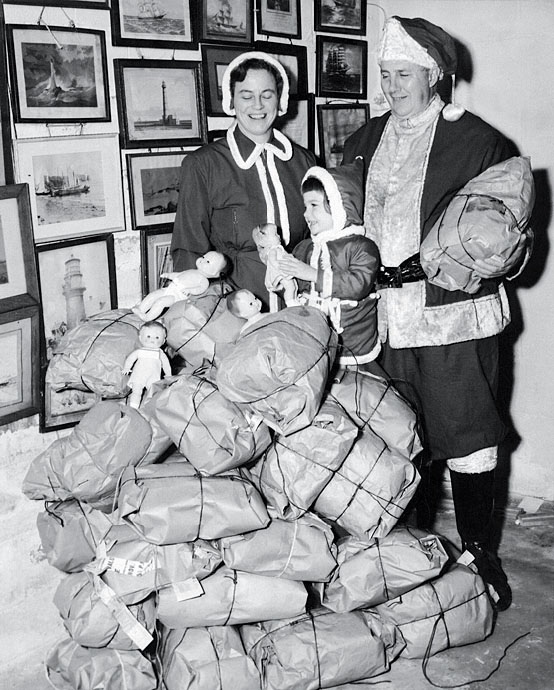 Snow and his wife load up (1940). The entire family makes ready (1954). 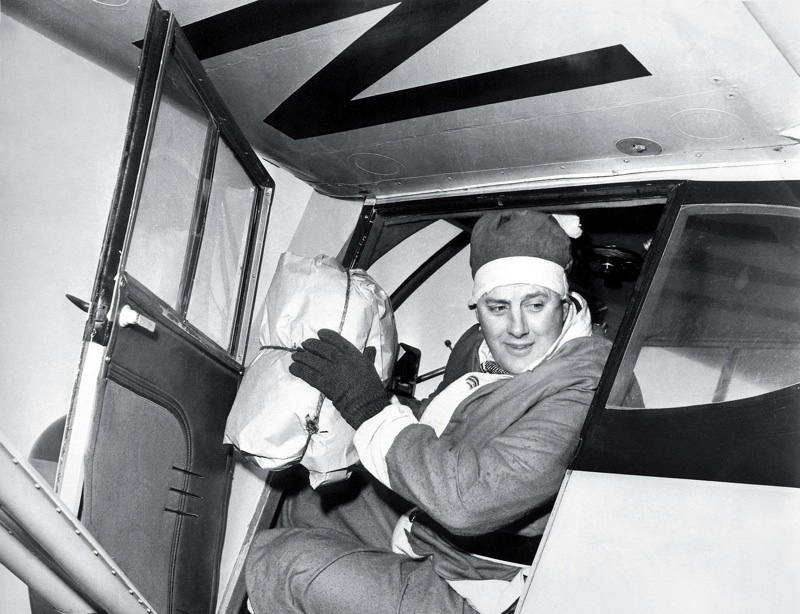 [extra:Extra] View several videos of the “Flying Santa” in action, including his first helicopter flight and a 1967 interview. 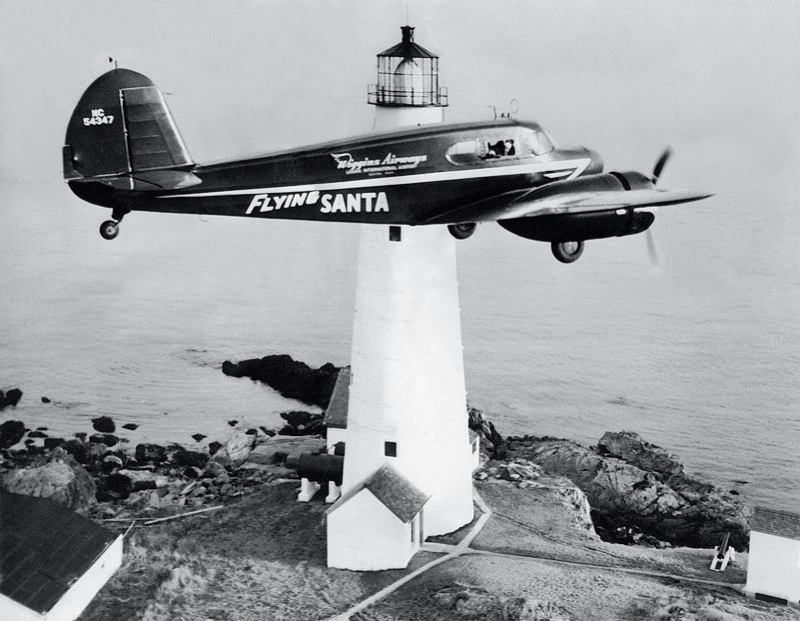 Edward Rowe Snow ’32 may have been the oldest member of his class, but his career as “Flying Santa” to New England’s lighthouse keepers proved him its youngest at heart. Growing up in view of Boston Harbor, in Winthrop, Massachusetts, and lured by his mother’s colorful tales of life aboard ship with her sea-captain father, he spent nine years after high school working his way around the globe on sailing vessels and oil tankers. “[I wanted] to see a little of the world when I was young enough to enjoy it,” he wrote in his class’s twenty-fifth reunion report. The romance of the sea became the subject of his more than 40 books; Storms and Shipwrecks of New England, A Pilgrim Returns to Cape Cod, and The Lighthouses of New England in particular were staples in New England homes. He temporarily halted his adventures to enter Harvard at 27, concentrating in history and whipping through in three years by attending summer sessions. A month after graduation, he married the soul mate he had met in Montana and brought her back to his beloved New England. Anna-Myrle Haegg was not only along for the ride; she was an eager co-pilot. For the next 50 years, she paddled the bow of his canoe as he explored the Boston Harbor islands and bumped along beside him as he dropped presents from a twin-engine plane to lighthouse children from Maine to Long Island—sometimes even to the Great Lakes, Florida, and the West Coast. Snow’s only child, Dolly Snow Bicknell, who accompanied her parents on the lighthouse deliveries until she went to college, remembers the flights as “bumpy, rough, and scary.” Flying at what would be illegally low altitudes today, cutting the speed to insure accuracy, the plane would circle the towers three times: once to signal, once to make the drop, and a third time, to check the drop. 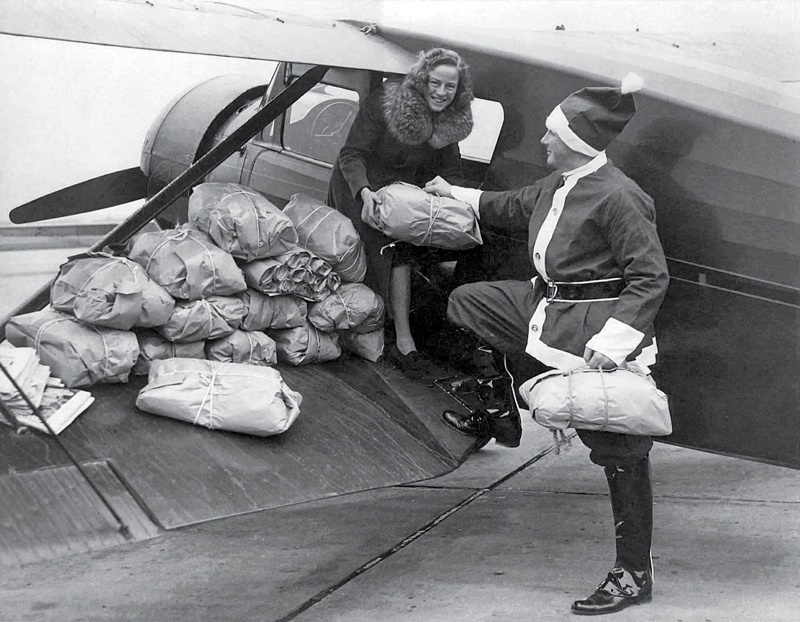 Simple gifts—a doll, candy, and a copy of his latest book—along with the cost of leasing a plane and pilot, came from Snow’s pocket; even after he became a local celebrity, his family lived frugally to fund the annual flights. “We always had piles of stuff around the house waiting to be bundled,” Bicknell reports. She recalls “the signs that people had made on the ground…‘Hi Santa’ and ‘Merry Christmas,’ and when we landed to refuel and got to meet some of the families, I saw how special this tradition really was—how much people appreciated what he did.” Snow became a favorite of the keepers and their families, returning often to collect their stories for his columns, radio and television appearances, and lectures. In his fiftieth-reunion report, published posthumously, Snow quoted Tennyson’s “Ulysses”: “Tis not too late to seek a newer world./...To sail beyond the sunset, and the baths/ of all the western stars, until I die.” Fortunately, for the generations of writers, historians, and coastal preservationists inspired by his example, he discovered this newer world right outside his back door. His daughter recalls how in later years, when shrapnel in his ankle precluded hiking into the marsh to dig clams, his favorite pastime, he went by canoe instead. “He said that five minutes after he left the house, he was away from everyone and everything”—the gregarious storyteller ever returning to the sea. Sara Hoagland Hunter, Ed.M. 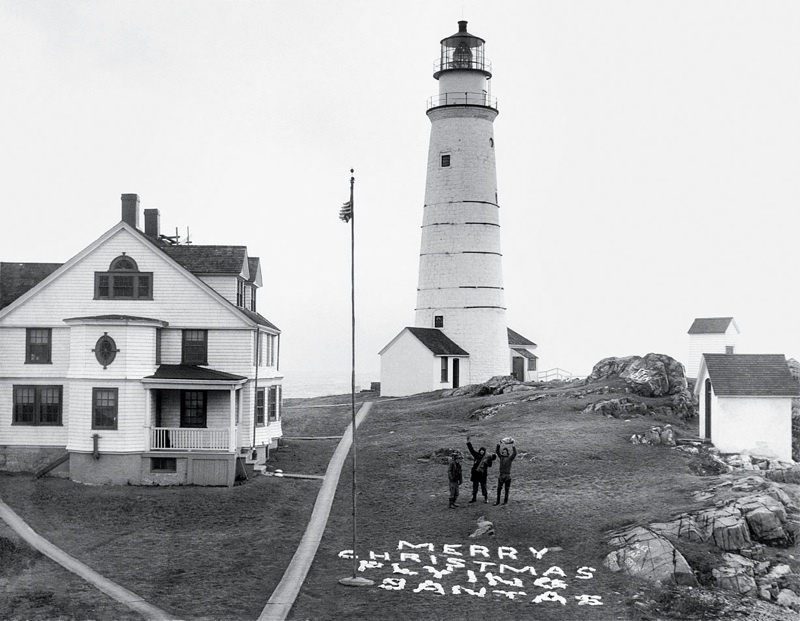 ’86, has written nine books for children, including The Lighthouse Santa, based on the Christmas flights of Edward Rowe Snow (University Press of New England, 2011).